Plus Size Kitten: Dettol Natural Review & Giveaway! Do you have sensitive or dry skin? Look no more because Dettol's newest range of bodywash using natural ingredients like olives and chamomile is able to nourish and moisture your skin while protecting you against harmful germs and bacteria. The range is called Dettol Natural and its available in two variants - Nourishing and Soothing (which I will show what's the difference below). A household brand that's trusted by generations of families and medical professionals, my dad is the biggest fan I tell you! For years we have been using Dettol body wash, the smell just stays with you. However some of my friends who can't stand the anti-bacterial or "hospital" scent as they say, will be surprise that the latest Dettol body wash does not smell strongly that way anymore! Don't get me wrong, I like the smell of Dettol and the latest Dettol Natural smells even better! 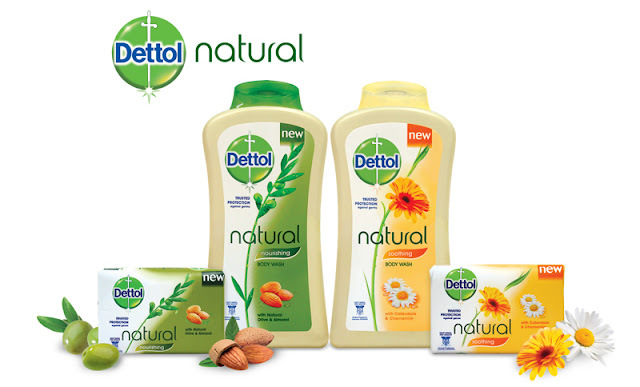 Formulated to suit the lifestyle needs of our discerning consumers - especially young adults & young mothers, Dettol Natural comes in two variants; Dettol Natural Nourishing and Dettol Natural Soothing, encapsulating a true sense of nourishment, soothe and most importantly giving you a healthy and soft skin feel. The all new lifestyle packaging is concept around nature greenery, the Nourishing range being a soulful green and the Soothing a cheerful yellow. 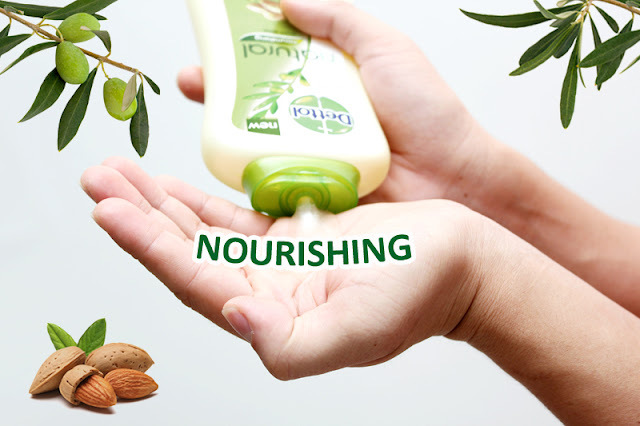 For those who seek the goodness of natural ingredients in a body wash, Dettol Natural Nourishing means an end to their search and will be an obvious pick as it is formulated with the richness of soothing almond extracts and silky olives that aims to restore skin’s moisture leaving a soft, tender and supple feeling at all times. Dettol Natural Soothing on the other hand is created with a concoction of fresh flowers, namely Calendula & Chamomile which are commonly used for soothing and calming effects, complementing the needs of those with more sensitive skin. this is how you have fun in the shower! My verdict on the Dettol Natural Body Wash? I tried both variants over a week. The difference between Nourishing and Soothing are the scent and the after shower skin feel. Dettol Nourishing has a stronger scent than Soothing, leaves your skin moisturized after wash and protects from dryness after. Dettol Soothing was a perk me up kinda shower experience thanks to its refreshing scent and clean after wash feel. My favorite on a hot sunny day is Dettol Soothing to keep me fresh and happy. When I need to shower before sleep, I'll use Dettol Nourishing to protect my skin from air-conditioning. Both smells great but the scent lingers off after shower. They lather up easily (check out the shower demo photos from my "heng tais" who helped me try Dettol Natural for my review). The liquid is transparent, I thought it would be in green or yellow. They do not become milky like Dettol's classic body wash.
250ml Dettol Natural body wash up for grabs! 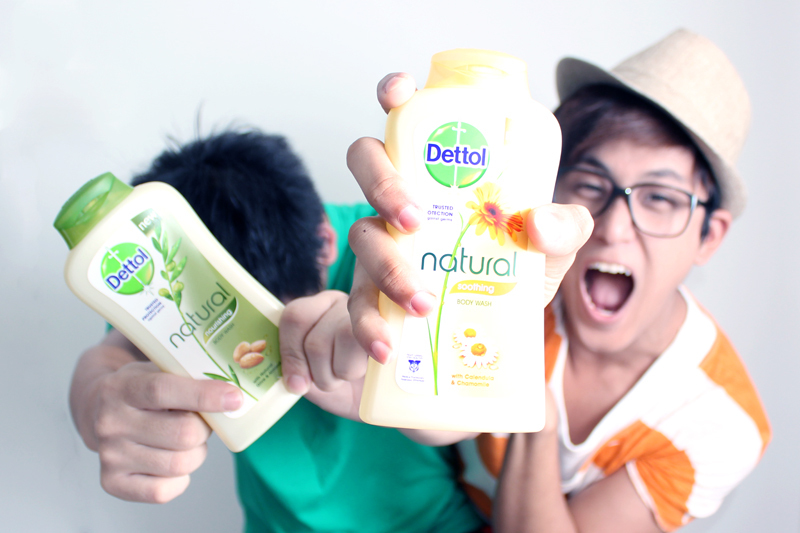 If you want to have fun in the shower like Jeremy and Noel and create a shower-ific experience then be the first 30 followers to leave a comment in my Dettol Natural Giveaway! The giveaway is open to followers who can pick up the prize from my house in TTDI/One Utama. Sorry I can't post the prizes as it's heavy and there's 30 bottles in total. Those who would like me to post please e-mail me personally about it. 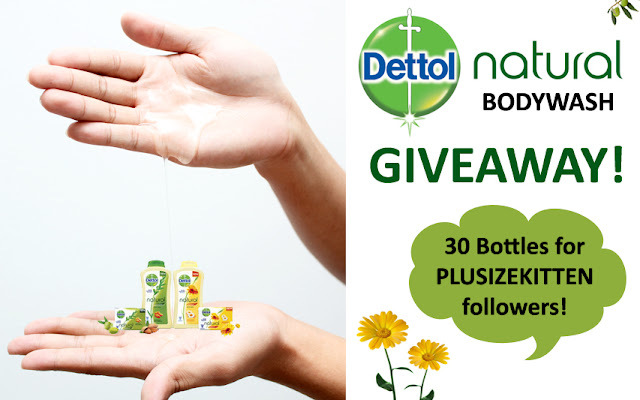 How to join the Dettol Natural Plusizekitten Giveaway? Question: Which Dettol Natural do you like and why? Giveaway starts 27th Aug - 3rd Sept, 2012. Results will be announced afterwards. Pick up is available upon appointment at TTDI/One Utama. There's 15 bottles of soothing and 15 bottles of nourishing to giveaway. If the variant you want is not available, you will get the next available variant. WHICH DETTOL BOY DO U LIKE? Whichever is your favorite, know that Dettol will give you the germ protection that you need. If you can't wait for my giveaway, then grab Dettol Natural from leading hypermarkets, supermarkets and pharmacies in Malaysia. The price ranges from RM8.50 - RM19.90. I would like to try the Dettol Natural Nourishing because I have dry skin and would like to try the latest bodywash to know the difference! No.2, u got Soothing! thx for joining my giveaway! Please let me try the Dettol Natural Soothing as i wanna keep calm n fresh and happy always! Hi Nadiah! :) u got Nourishing! let me know how we can meet yeah. I want Dettol Natural Nourishing because my skin very dry need moisturized all day. 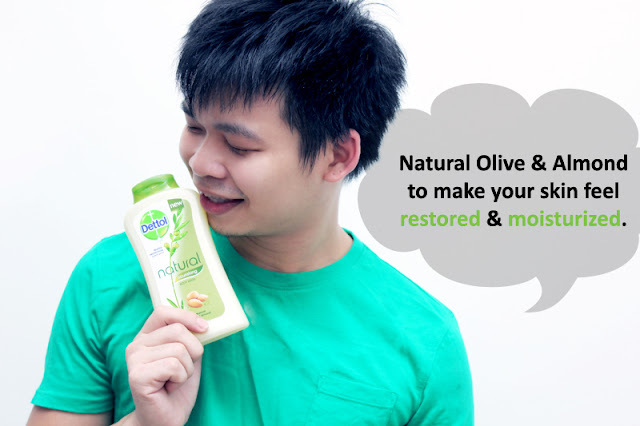 I like Dettol Natural Nourishing, as it help to moisturise my skin even in a long hot shower. (^________^)" and the smell of it is a plus. Question: I would like the Dettol Natural Soothing as after a hard day at work, coming back to play with my doggies, I need a something soothing and relaxing for body, mind and soul. What's better than a bottle of Dettol Natural Soothing to do the job. sure Sri, thanks for being so considerate! I would like to try Dettol Natural Soothing, let my skin fresh & soothed. I like Natural Nourishing because I want my skin to feel supple, soft & tender! Ans : I like Natural NourisHing because it can my skin smooth dan supple and make my skin fresh too..
Vina I miss u :) i feel it's going to be soon that we'll see each other! No.16, Sharon! :D which event u're going let me know, if i am goin will bring n pass u! Answer: I've been loving Dettol since forever (was born a slightly germaphobic kid :p). Now that I'm an adult with dry skin, I'd really love to try Dettol Natural Nourishing because who doesn't want to be germ-free and well-moisturised? Thanks Miu for the awesome giveaway! I really really like the Dettol Natural Nourishing because i super hate germs and super hate dry skin as well! hehe..
no.20 Siyuan collected :) hope u like it! which one was it again u chose? I want to try the Dettol Natural Nourishing! i wan to be nourished ! no,21 Wendy :D long time no chat with u, one day we meet in event gona pass to u! 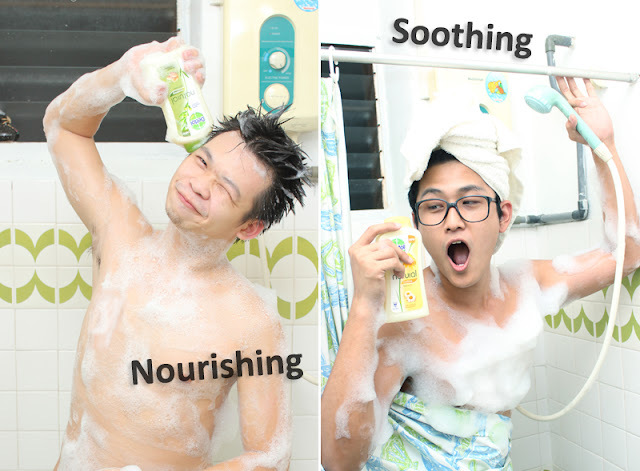 I pick the Dettol Natural Soothing because I want to experience the soothing and calming effects after shower! Thanks Tammy for the giveaway! No.22 Lilian, how have u been? hope to see u more at Only Beauty workshops! I'm pretty sure next one coming up..
collected! :) thanks for joining the giveaway! Soothing because I am an avid user of Dettol (original). Would love to try the different range of Dettol. 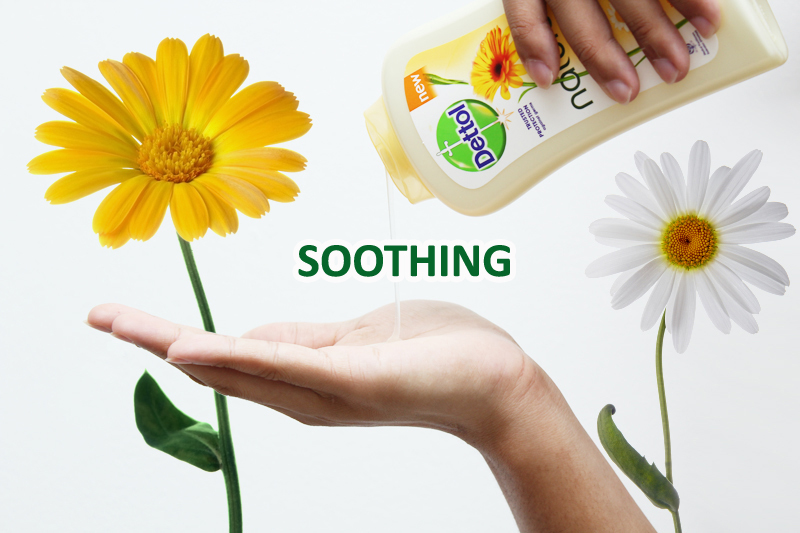 I want to try Dettol Natural Soothing because I love Calendula scent. I want to try Dettol Nourishing as I got dry skin. I want try the Dettol Natural Soothing because I have sensitive skin. I want try the Dettol Natural Nourishing because it keeps me moisturize every time. 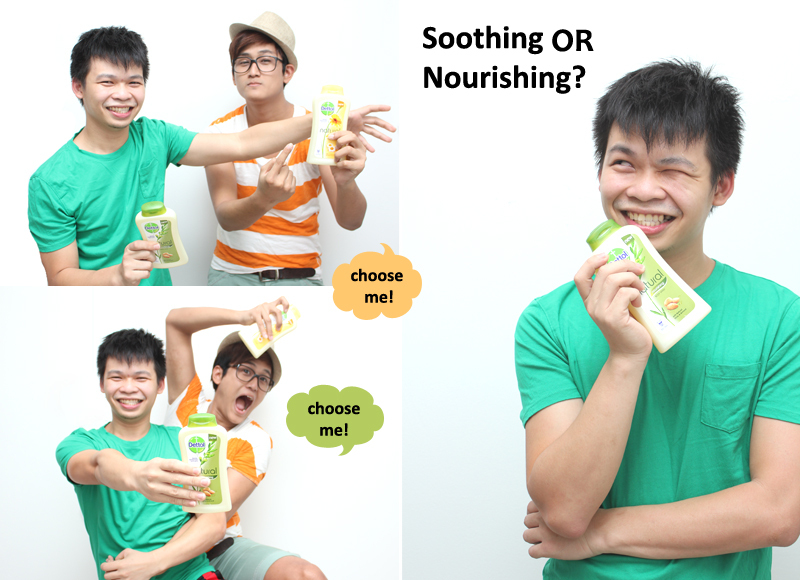 p/s:haha the 2 models quite funny...u did a lot of efforts for blogpost!Kudos! No.29 Emily! :) the models r funny yeahh!!!! i like 'em too. Thanks for noticing my "sweat" in this post!! keke..althought dun even c my face in, the dettols boys glamour de! Let me know when u wanna come collect yah. no ler, out of town this Sat, how can I collect it? Will keep my fingers crossed i can be contacted via my email. Since no 7 is not able to pick up does it mean i am no 30? I want to try Dettol Natural Nourishing because i have dry skin. so sorry fiseel... u missed the number... T____T next time yah?